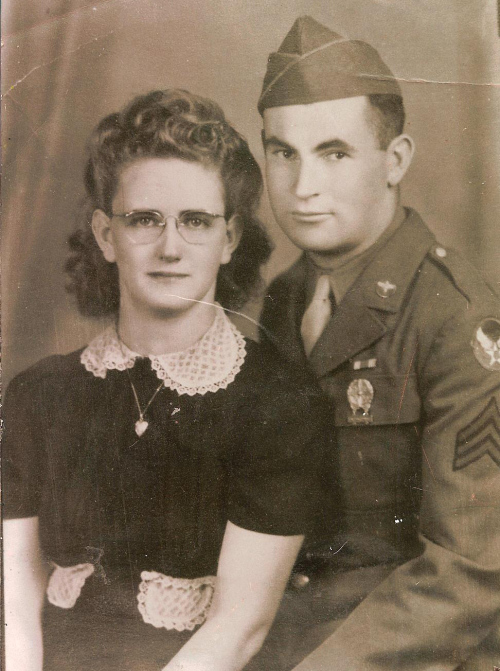 Granny and Grandpa - October 13, 1943 Bud and Betty Hahn, their wedding. She was 19 and he was 24. My grandmother entered the hospital on November 16th suffering from intestinal distress, vomiting and abdominal pain. She had a twisted bowel that was operated on that Friday, six inches of necrotic intestine had to be removed. The hospital is horrible for my grandmother. Her lack of short term memory creates a situation of reoccurring distress as she realizes that she no longer remembers where she is, or why she is there. The daughter of tough Scottish immigrants and a child of the depression she was taught early and well to not complain, protest or make trouble for anyone – she won’t ask for pain medication, ring for the nurse or inconvenience the staff in any way – even at the cost of her own discomfort. The staff doesn’t always catch onto this fact and with no one to sit and encourage her to ask for additional pain medication or attempt to eat she fails to provide even the smallest comfort for herself. It is distressing to see her so thin and frail and ill. Things change quickly – day to day there is a switch in plans. Over the course of two weeks one surgery turns into three, hopes of grandma returning to her private foster-care placement are abandoned. Part of this switching of plans has to do with the fact that my grandmother’s condition is hard to predict, at 86 she can’t recover from something a quickly as a younger person would, she is weaker still because of her failure to eat which also slows healing and in turn opens her up to more chances for opportunistic infection. On top of this there is a continual disconnect between what is communicated between the hospital and the care-facility she has been living in. One day she can return to where she has been, the next day she needs more rehabilitation. Differing opinion from family about what the treatment goals should be – my mother has a difficult time accepting that her mother will probably not ever fully recover – she seems to hear what she wants and ends up asking for treatments that are not suited to my grandmothers condition. I spent some time talking to the doctors and nurses, the hospital social worker, my husband and my father and, most difficultly, my mother, but at last we all got onto the same page and were able to make the decision to stop curative care and pursue palliative care. One of the social workers I spoke with remarked that choosing this route is always a difficult decision. But it really wasn’t. I don’t think the choice was hard. Like so many “crisis” choices the decision itself was very easy. Of the options presented — this was the best choice, the best option, the only real option. The difficulty lays in the afterward. Those moments in the late evening sitting on the sofa in my room with a glass of wine wondering about the possibility of alternatives that in the light of day and without the leisure to hope for the impossible were not allowed to push themselves forward. The hope of hanging on for a miracle – a miracle but to what end? When the thought is carried through to the logical conclusion to even pray that my grandmother would live through this was almost cruel. The best to be hoped for would that she would once again be living in her care-facility with memories slipping away daily — blowing away like the autumn leaves . The best would be her mourning the loss of grandpa as she had for the past 14 years waiting for the day she would see him again. All the while in pain from her surgery, her hip, her aging body. How could anyone ask this dear woman who has given so much to us to carry this horrible burden farther? I am not so naive to think that suffering and pain do not work to good ends in God’s wisdom, but while I might pray for the grace and fortitude to see through my own pain – my earnest prayer for my grandmother is that God grant her peace and freedom from suffering. Prayer, there comes a point where our medicines become torture and we need to set those things down and pray. There is a place where only prayer can help and only death can heal us – rebirth us to heaven where hope to meet in a sun filled morning that one who suffered so much for us, Christ. He will known, understand intimately, the pain we suffer and he will hold us close and wipe away all tears. This becomes the prayer when the prayer for healing stops and the prayer for heaven begins. The choice to go with palliative care changed the way medicine worked with my grandmother. The catechism says: “Discontinuing medical procedures that are burdensome, dangerous, extraordinary, or disproportionate to the expected outcome can be legitimate; it is the refusal of “over-zealous” treatment. Here one does not will to cause death; one’s inability to impede it is merely accepted. ” This acceptance provides so much relief for my grandmother. No longer did the kind physical therapist force her to stand and take two or three excruciating, shuffling steps. Uncomfortable monitoring equipment was removed. The rules limiting the visits of my children disappeared and they were all able to come and see their beloved granny again. A hand-made quilt took the place of impersonal white hospital linens and a cart of refreshments magically appeared in the hospital room every evening for family. We were blessed that one of the nurses working with my grandmother, Linda, was a good Catholic lady, a convert, as was my grandmother and as am I. When the priest was called for last rites he was unable to arrive before I had to return home. The next evening Linda was able to share with me how lovely it was. My grandmother had awoken when the priest arrived, she had been awake and coherent and responsive. Since I wasn’t able to be there personally it meant so much to have someone who understood the rite be able to express to me how spiritual an experience it had been for my grandmother. My grandmother’s lack of short term memory robbed her of the ability to communicate such things to me herself. It was simply a blessing that someone was there to pass the experience on to me for safekeeping. After the weekend my grandmother is transferred to a skilled nursing facility. My parents and I meet there with the hospice nurse from Providence and she explains their services. Their goal for the patient is pain management and they are there to support the family in dealing with the transition of their loved one from life to death. Talking with the social workers and nurses I begin to see how much of a process death can be, how it is a real transition in the sense of moving from one stage of the soul to the next. We look forward to the resurrection of the dead and life in the world to come. For us death is not a “dead-end” it is a doorway, beyond it there is more. After three weeks in the hospital my grandmother is moved to a skilled nursing facility. The hospital was much more pleasant in ways — in my heart I want her to go back to her old care facility with the spirited Romanian immigrant who loves my grandmother. I find myself sick with a head cold for the first week after grandma is moved so for almost a week I don’t see her. I feel guilty “abandoning” her in that gray place, but I certainly don’t wish to burden her with a cold on top of her other physical complaints. When the nurse calls and tells me that my grandmother has begun to decline I have to see her. Kyle and I spent the evening on Tuesday with her. She was happy and feeling in good spirits. We talked about fishing and lambs, knitting and the children, we talked about my grandfather and how much we loved one another. Kyle and I each held one of her hands and visited. We gave her kisses as we left and she smiled and said “Such happy, happy memories.” When we got home Kyle commented on how tightly she had squeezed his hand when we said we had to leave and I told him that when she gave him a kiss she was giving one to my grandfather too. In some way all those beautiful memories of her long and happy life had come unmounted to time and floated together all equally present and all equally precious. All the memories were now and all the love in her whole life was with us right then in that moment and the moment was all that mattered. Memories are one of the few earthly treasures that we can take with us. Each precious reflection connects us to each other and to ourselves. Memory of prayers answered, miracles experienced and blessing given us from heaven build and strengthen our relationship with God. He draws us closer to him with our own stories, both the good and the bad. He uses it all for our good. That night I dreamed of my grandfather and a cabin in the mountain near a crystal blue lake in the meadow. I could hear children laughing and could see sunshine-golden hair playing in tall grass. They were waiting for grandma, my grandfather, the babies we lost before we had a chance to hold them… they are there. It is not quite heaven just the fringes, heaven is still a short distance away where the white city of God gleams in endless morning. This is just a dream- a dream of something comforting, some whisper that everything is good with those I have loved and lost. They are there together waiting for her. The next evening is so different. My grandmother can no longer speak; she is waiting, slipping. The next morning I spoke on the phone with hospice and the nurse was surprised at how swiftly she had declined. That evening I went to the care facility immediately after dinner, somehow I knew even before I left home that I would be there until she passed. Kyle seemed to sense this as well and urged me to take all the time there I could. So I could be there when she needed me. The only thing I can compare it to was being at Serenity’s birth. A birth is also a transition, work, important and sacred. It is part of god’s plan for our experience and for our ultimate union with him. It is inescapable. When you share this with someone, when you are there when someone you care about goes through this it disconnects you from the mundane for a short time. It can go well, as it did at both the birth and death I have attended or it can be difficult, though I can not imagine it ever being easy. When I arrived Granny’s breathing was labored my mother had stopped by on her way home and asked the nurses to give her oxygen. There was a definite change. The waiting had ended and this was work. All I could do was sit and hold her hand and rub her shoulder with lotion. Prayer, again it came round to prayer. I found myself singing “Let all mortal flesh keep silent.” It just seemed the only thing to be in my head, but right there with only the sound of her breathing and the pump and hum of the oxygen machine it made sense that silence was imminent. I told her about my dream and the beautiful valley and grandpa waiting for her on the wide deck overlooking the lake with the fish jumping and the curious deer at the edge of the woods and I asked her to look after my babies and I gave her a kiss and told her I loved her and she was gone. And the room seem small but at the same time something sacred had occurred there. And I know that angels were leaving and that my grandmother would soon be able to be home. I could almost her my grandfathers’ voice welcoming his “little bride” just like he used to call her when he would come up behind her in the kitchen for a hug and a kiss. And all is good with those I have loved and lost. I got choked up reading this. My prayers are with you and your grandmother. God bless you. You are currently reading In the end it is all ok at Simply Catholic.